What's the appeal for Biden? While "Poetry & Popular Culture" has been unable to reach Barack Obama's running mate himself, our source sorta close to Biden comments: "I think Heaney's poem taps into the growing sense of frustration that this country feels, knowing our past flirtations with rebelling against inept power. And I think this poem is appropriate for Joe and Barack because together they represent hope and history." "Poetry & Popular Culture" now eagerly awaits McCain's choice of running mates. 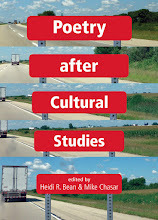 What shall his or her poetic preferences be? Poetry & Popular Culture correspondent Jeff Swenson writes in reporting (hubba hubba) on the racy poetry of canoedling from a time when modern love was reaching, er, something of a tipping point. At least as early as the 1880s, “canoedling”—the canoe-based variant of “canoodleing”— was becoming tableau in American culture. 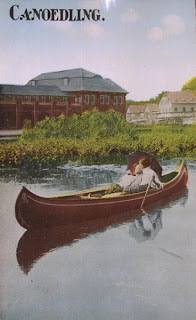 The still-popular image of a man in the stern, paddling, and the woman reclining on cushions in the bow, often covered by a parasol, was commonly reproduced in magazines, calendars, advertisements and postcards. The mass production of wood-canvas canoes in the late 19th and early 20th centuries helped to make canoeing popular recreation, and young folk soon found the canoe was a remote—and sexually liberating—place for courtship. Oh! She never says "No"
Oh! If she'd only say "Throw your paddles away"
You can listen to a recording of “Paddlin’ Madelin’ Home’” at http://www.youtube.com/watch?v=0qtb4crdahg. Better yet, grab your uke and hit the river with your favorite gal before the summer is up. Jeff Swenson writes from Garrettsville, Ohio, where he is Assistant Professor of English and Director of the Writing Center at Hiram College. 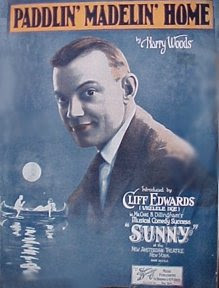 TRIVIA QUESTION: What famous cartoon character did Ukulele Ike voice?